"This is the best thing that has ever happened to me." Those were the words out of Brandon Paster's mouth shortly after winning his first bracelet in Event #37 of the 2014 World Series of Poker. Paster ended Day 1 with the chip lead and after Day 2 he was second in chips, a mere 16,000 chips behind the eventual runner-up, bracelet winner Marcel Vonk. When play started today, 11 players had dreams of winning a bracelet and the $264,400 first-place prize that went along with it. It would start off slow, with only a few eliminations in the first six hours of play, but then the chips started flying and Paster would use aggressive play and big hands to emerge victorious. To ultimately get to that point, Paster would have to outlast a tough lineup that included AP Phahurat (11th - $14,908), Galen Hall (9th - $18,837), Kevin Saul (8th - $24,111), and PokerStars Team Online Pro Gabriel Nassif (3rd - $102,373). When asked about the tough lineup, Paster said "I was gifted with the best situation possible. All the aggressive players were on my right. I was very comfortable the whole time. 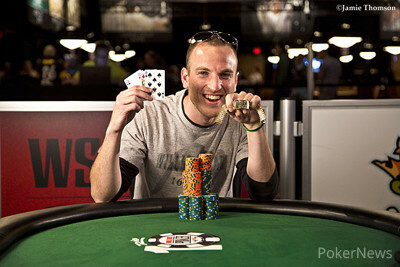 To be honest, it didn't feel like a WSOP final table." The first big hand for Paster would come when he eliminated the very formidable Galen Hall when Hall's wrap draw was unable to hit and Paster hit a draw of his own by hitting the nut flush on the river. Gabriel Nassif would give Paster some trouble with well-timed raises and Paster would double up Nassif several times before he was finally able to knock him out in third place. The hand that would do the deed would see Nassif ahead on a flop with his but Paster's would hit two pair on the turn and that would enough to send the Frenchman to the rail. Heads up play was over in just three hands and the final hand would see Paster holding to Vonk's . Vonk would flop two pair and for a moment looked as if he would make it a match but the on the river would have him celebrating with his rail and joking "it's no big deal." A total of 967 entrants would turn up for this event creating a prize pool of $1,305,450 with 117 of those players receiving some compensation for their efforts. Among those cashing were the likes of Erick Lindgren (13th - $11,957), Martins Adeniya (16th - $9,712), Will Durkee (23rd - $7,989), Fabrice Soulier (42nd - $5,639), and Layne Flack (64th - $3,555). Humberto Brenes would also cash, for an amazing eighth time this WSOP, finishing in 102nd place for $2,480. Plenty would enter the tournament with big dreams only to come up short. Jonathan Little, Chris Moorman, Joe Cada, Barry Greenstein, Dominik Nitsche, Scotty Nguyen, Annette Obrestad, Carlos Mortensen, Keven Stammen, Paul Volpe, David Williams, and Jason Mercier were just a few whose dreams were momentarily crushed. The over a quarter-million dollars that Paster won was in his own words "my biggest score by a couple hundred thousand dollars." The poker professional told us afterwards that "I'm on cloud 9. This is unreal." Unlike most poker players who would be looking to parlay this success into bigger buy-in tournaments, Paster only has plans on playing one more tournament the rest of the summer (the $1,500 Pot-Limit Omaha 8 or Better) and then it's off to Amsterdam for a month or two and travel the world. "I got everything I want," he said. "Now it's time to party my face off." Thank you following along with PokerNews in our continual coverage of the 2014 WSOP. We'll be here until the very end so make sure to check in often for updates on all the exciting poker action. Did you know that even if you can't make it to Las Vegas this summer, you can still win big bucks in five PokerNews-exclusive freerolls at PokerStars? A share of $50,000 can be yours just by creating your PokerStars account using our marketing code "POKERNEWS.COM" or by playing a minimal amount if you already have an account through us. Click here to read more about the offer and eligibility requirements. Hand #154: Brandon Paster raised to 150,000 and Marcel Vonk folded. 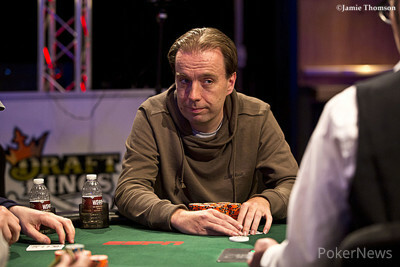 Hand #155: Marcel Vonk limped and Paster checked his option. Vonk bet the flop and folded when he got check-raised all in. Hand #156: Paster raised to 150,000 and Vonk moved all in for 200,000. Snap call. The flop was a little upset for the dominating chip leader, but he got there on the turn and the river to score the knockout. Both opponents shook hands while Paster's rail erupted in festivities. 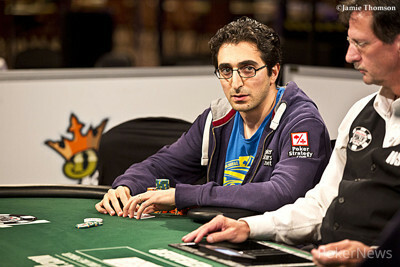 Nassif called out to his rail the cards he needed to avoid to stay ahead. One of those was a nine, which is precisely what the dealer would put out on the turn as it was the . Now it was Nassif who needed to catch a card but he would be unable to do it on the river and would be eliminated in third place. Hand #149:Brandon Paster received a walk in the big blind. Hand #150: Marcel Vonk opened for 100,000 and Paster made it 350,000 to go. Vonk made the call. The flop came and both players checked. The turn was the and they again checked. Paster would lead out for 300,000 on the river and Vonk would fold. Paster would turn over his hand, showing that he had it all, as he had for a flopped straight that turned into a full house on the turn. Hand #151: Gabriel Nassif opened for 150,000 and won the blinds. Hand #152:Paster received another walk. Hand #144: Brandon Paster raised to 125,000 in the small blind and got the big blind of Gabriel Nassif. Hand #145: Paster raised from the button for 125,000 and won the blinds. Hand #146: Marcel Vonk limped from the small blind and Paster checked his option. On the the Dutchman bet and scooped the pot. 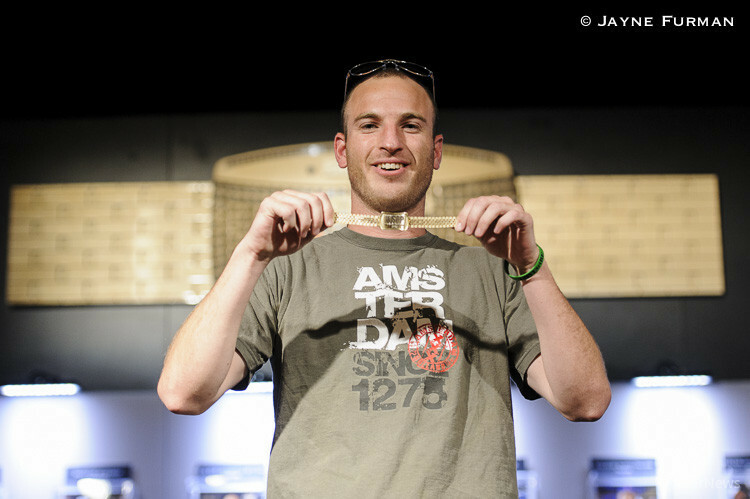 Hand #147: Vonk raised to 100,000 from the button and got himself the blinds. Hand #148: Nassif limped from the small blind and Vonk checked. They checked through the board and Nassif won the pot with a king in his hand. The players are back from their dinner break and have resumed play.